I've been rather busy of late, but we did tick another item off the summer wishlist. The Saturday before last my son and I took a quick trip to the farmer's market. In the days before kids, my sister and I were regulars at the market, but these days it's more of an annual event. I missed two of the vendors I was counting on seeing (fudge and wooden toys) and saw many of my old favorites, as well as a trend toward fermented food. 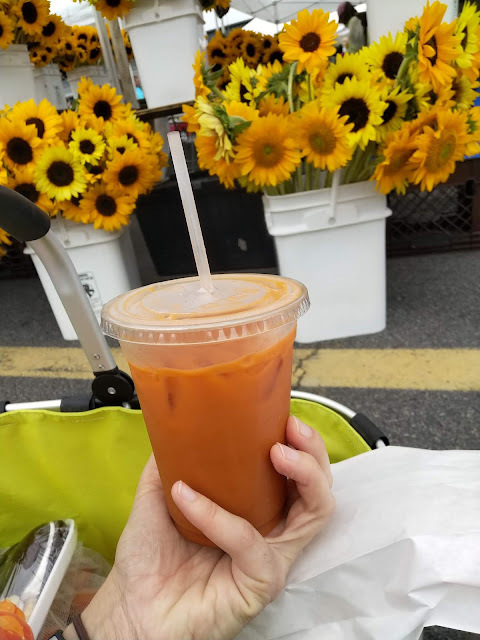 The highlight for me is Thai iced tea and my son loves the stretch bread. Glad you got in a trip to the Farmer's Market--I used to love to do that. There's one here. but we haven't been in a long time.